There’s a real passion in our Strawberry Passion White Tea. It’s also a Village Tea Company favorite and tastes great cold. Rich and intense, this white tea marries full leaf-and-bud Chinese Bai Mu Dan (white tea) with flavorful and fragrant strawberries to enhance the naturally mild sweetness of white tea. Our Strawberry Seduction White Tea is a sultry way to wind down a long day or to get one started. Indulge yourself with this decadent white tea. I’ve had great luck with the offerings from Village Tea Company and here is another one. It’s called Strawberry Passion and it’s a White Tea and it’s darling! This is a gentle yet flavorful strawberry flavored white tea. It’s very good both hot and cold. It’s smooth but fruity and fun and thankfully NOT sour or tarty or puckery. 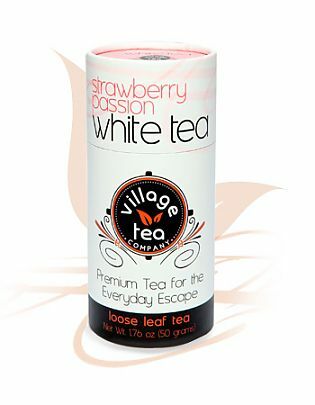 The perfect flavored white tea to escape from everyday hustle and bustle.